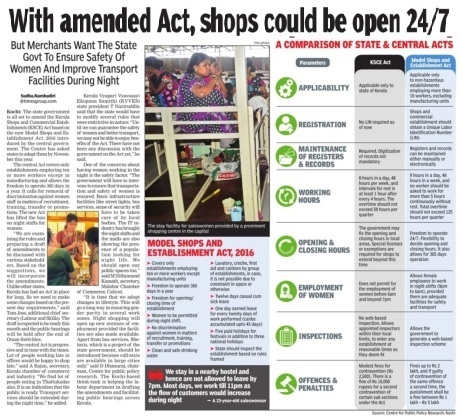 The state government is all set to amend the Kerala Shops and Commercial Establishments (KSCE) Act based on the new Model Shops and Establishment Act, 2016 introduced by the central government. The Centre has asked states to adapt them by November this year.The central Act covers only establishments employing ten or more workers except in manufacturing and allows the freedom to operate 365 days in a year. It calls for removal of discrimination against women staff in matters of recruitment, training, transfer or promotions. The new Act has lifted the ban on night shifts for women. “We are examining the rules and preparing a draft of amendments to be discussed with various stakeholders. Based on the suggestions, we will incorporate the amendments.Unlike other states, Kerala has had an Act in place for long. So we need to make some changes based on the present day requirements,” said Tom Jose, additional chief secretary (Labour and Skills). The draft is expected to be ready this month and the public hearings will be held after the end of Onam festivities. “The central Act is progressive and in tune with the times.Lot of people working late in offices would be happy to shop late,” said A Rajan, secretary , Kerala chamber of commerce and industry . “We find lot of people eating in Thattukadas also. It is an indication that the public is ready . Transport services should be extended during the night time,” he added. Kerala Vyapari Vyavasayi Ekopana Samithi (KVVES) state president T Naziruddin said that the state would have to modify several rules that were restrictive in nature. “Until we can guarantee the safety of women and better transport, we may not be able to enjoy benefits of the Act. There have not been any discussion with the government on the Act yet,” he said.One of the concerns about having women working in the night is the safety factor. “The government will have to intervene to ensure that transportation and safety of women is ensured. Basic infrastructure facilities like street lights, bus services, sense of security will have to be taken care of by local bodies. The IT industry has brought the night shifts and the malls are also showing the presence of a population looking for night life. We should open our public spaces too,” said M Nithyanand Kamath, secretary , Malabar Chamber of Commerce, Calicut. “It is time that we adopt changes in lifestyle. This will go a long way in ensuring gender parity in several work zones. Night shopping will open up new avenues of employment provided the facilities are also made available.Apart from bus services, She taxis, which is a project of the state government, should be introduced because call-taxis are available in large cities only ,” said D Dhanuraj, chairman, Centre for public policy research. The Kochi-based think-tank is helping the labour department in drafting the amendments and facilitating public hearings across Kerala.